"WHERE'D YOU GET THOSE KEYBOARD THINGS!?! THEY ARE SO CUTE!!!" I get asked about my keyboard everywhere I go: the airport, the plane, any where I am with my laptop! I love these little keyboard stickers and they make it more fun every time I type! *to take em off, just use some Goof-Off to get off left over adhesive. They are made for full keyboards, so you can see how I made mine work for my laptop. I think next I'm gettin' those Zebra ones! And you can have matching nails!!! 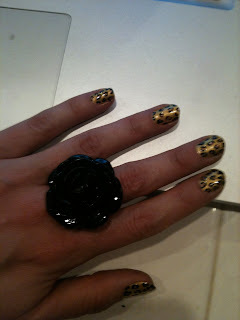 watch the video below how to get oh-la-leopard nails! I get so many compliments on my leopard print nails and toes! have fun adding some ooh-la-la to your laptop or computer! OMG I LOVE THAT !!! Im so getting those for my macbook! if only they had pink leopard print! those key covers are super cute! I must have the zebra print ones! zebra print is my addiction! i will have to get these lol as soon as i get a lap top! love the keyboard decals !!!!! and I love doing zebra print nails with sharpies lol, super easy. Very nice. Love the nails. I did some zebra print but instead of using white I used pink. I love those stickers so cute!! ★ One quick question if you don't mind I noticed you use a Macbook Pro and you have the keyboard that lights up, so with those stickers on does the keys still light up? that looks so awesome! what a great way to keep your keyboard clean. love it! 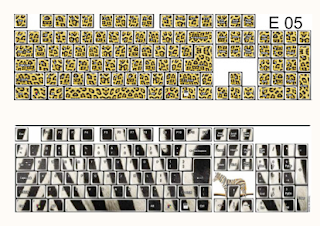 Have you heard of decalgirl.com they leopard, or zebra printed Skin for your macbook. here's the link to the leopard one http://www.decalgirl.com/item.view/17816. Do you know what I would LOVE to do? A monochrome look with a fleur de lis! this where'd you get that wednesday is a brillaint idea! I'm LOVIN' the funkeyboards and the bath creatures! !